Newly renovated! Quiet, private, short walk to the beach. This charming and newly renovated 3 bedroom, 2 bath ranch style home is located on a quiet street close to both Sunset and Shell beaches and within walking distance to Silver Beach off of Bootleggers Alley. We have bikes on hand to help you reach these and other beautiful destinations around Shelter Island. In the spacious backyard, which backs up to a nature preserve, you’ll find a brick patio with outdoor furniture, plenty of sun to sunbathe, lawn games, and an enclosed outdoor shower. 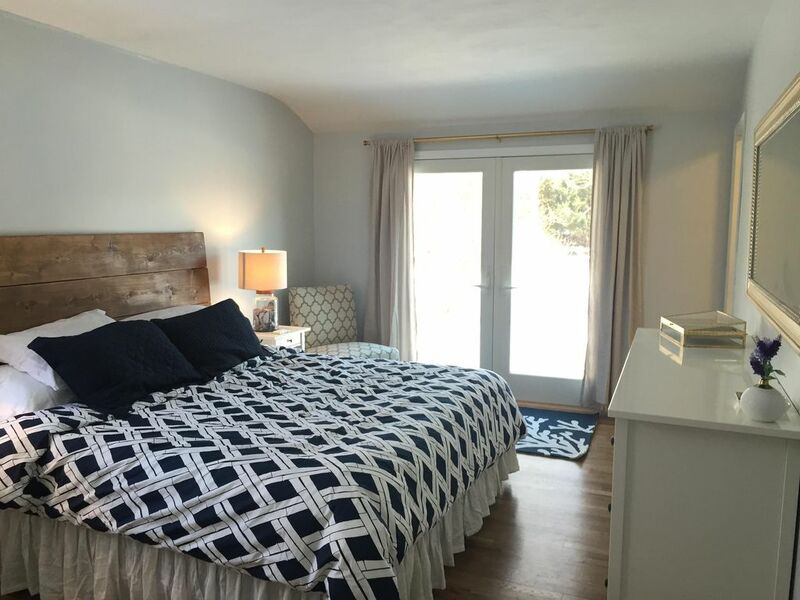 The master bedroom has a king-sized bed, en suite bathroom, and french doors that open to the serene privacy of the back yard. The second bedroom has a queen-sized bed, and the third bedroom has two twins – perfect for children or to share. Each bedroom has large closets and plenty of storage space. The hallway linen closet has towels for both bath and beach, sheets, and other comforts. The living room, which features a large bay window, has a plush and comfortable couch and matching love seat that both pull out for additional sleeping space. The formal dining room has a sizable table that fits up to 10 guests and a set of french doors opens to the park-like back yard. The kitchen, which has great counter space, also has a benched bay window overlooking the backyard, and all the conveniences of home: a dishwasher, an oven, a Keurig coffee machine, a toaster oven, a microwave, and all the necessary items to cook and host. Just off the kitchen is a den that’s stocked with board games and an entertainment system, as well as a cozy, exposed brick gas fireplace. The den’s sectional sofa also pulls out to create another sleeping space. Finally, the laundry room has both a washer and dryer and is connected to the one car garage. We live in Brooklyn full time, both working in Midtown Manhattan, and get out to Shelter Island as much as we can with our two dogs to enjoy the island, beaches, and food. We fell in love with Shelter Island once we spent some time out here for the first time a few years ago. We kept coming back because of the charm and welcoming nature from the island. The many beaches found on the island range from being a wonderful quiet getaway as well as a fun and lively gathering. Our backyard looks out to a beautiful forest. We are located 2.6 miles from the public golf course - Shelter Island Country Club. There are no tee times, it is a first come first serve basis. Very reasonably priced. We came to the island for a wedding and the accommodations were perfect for our family. Furnishings were very comfortable, especially the beds. The house tastefully decorated and felt more like a home . Would definitely return during the summer to appreciate all Shelter Island has to offer. Made use of the bikes and backyard when weather cleared and sun finally come out. Had a great weekend in this adorable cottage. spotless accommodations, comfy beds, beautiful deer sightings in yard directly behind house, easy access to main roads and town. The owners are wonderful and the house is well stocked. We really enjoyed having the bikes. Great location and very relaxing house! First trip to Shelter Island and we had a great time. House was very well appointed, with everything we needed for our stay in a nice, relaxing, peaceful setting. Will look to come back sometime in the future. Thank you for the hospitality Ashley. Beautiful home and equipped with all you need. Kids loved the bikes and parents loved the beautiful beach lounge chairs. Best VRBO property I have rented thus far! What a great house! Plenty of room for the 5 of us and more if your party is larger. Wish I had more time to spend in the area. Rode the beach cruisers that were provided to the beach one afternoon, Easy ride just down the road. The house was completely equipped with everything you need. I would certainly stay there again if I ever get back to Shelter Island. Ashley, was available to answer any questions. LOVED having a King size bed in the master. Plenty of towels, linens, beach towels all provided. DO NOT hesitate to rent this house, you will have a fabulous time!